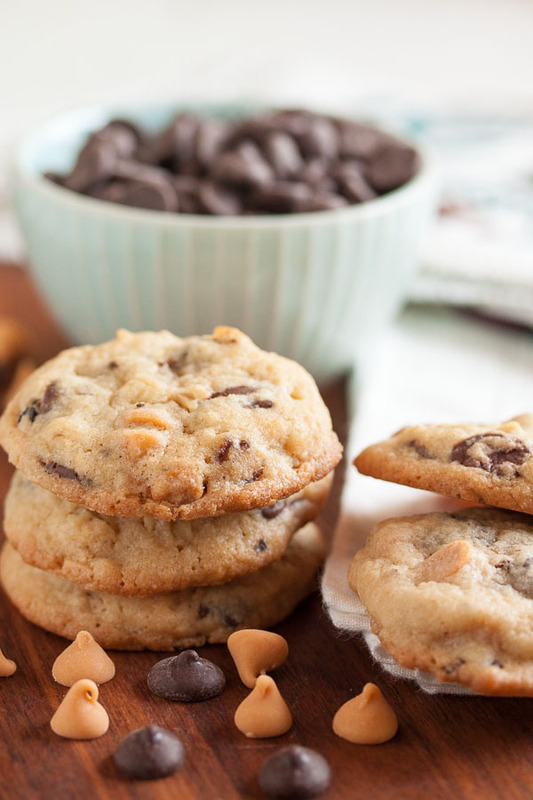 Butterscotch Chocolate Chip Cookies | wanna come with? Making those butterscotch lollipops a few weeks ago reminded me how much I love butterscotch (so much! ), so when I saw this recipe? I knew this was what I’d be making this week. 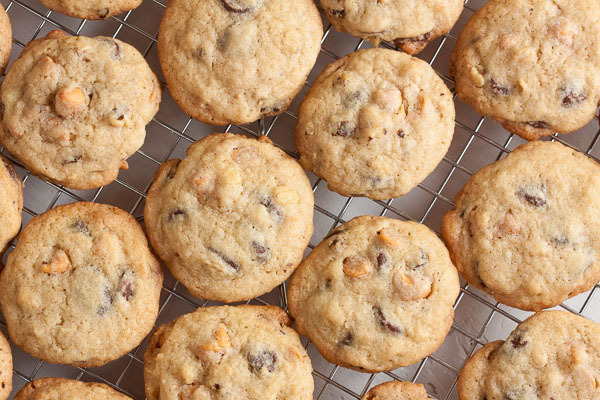 Butterscotch alone is good, but combined with chocolate it’s even better (it works amazingly with peanut butter too – seriously, you should try these peanut butter butterscotch cookies!). This little cookie was hugely popular among my coworkers. I saw one person walking away with a whole handful of them, and another person told me very seriously that this may be his new favourite cookie. And you’ll note that I’ve tagged this as a personal favourite too. Yup, this is a good cookie. 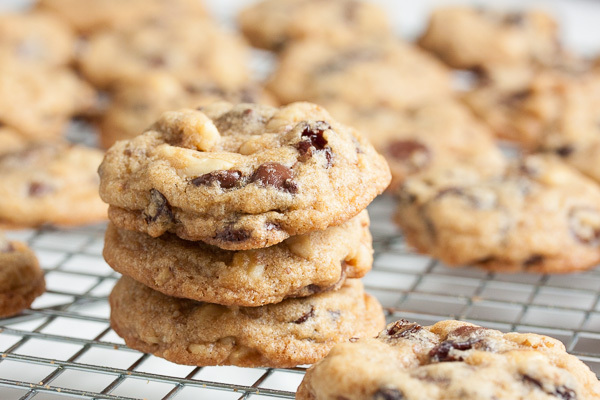 This cookie is based on the same recipe as these chewy peanut chocolate chip toffee cookies I made a few months ago. 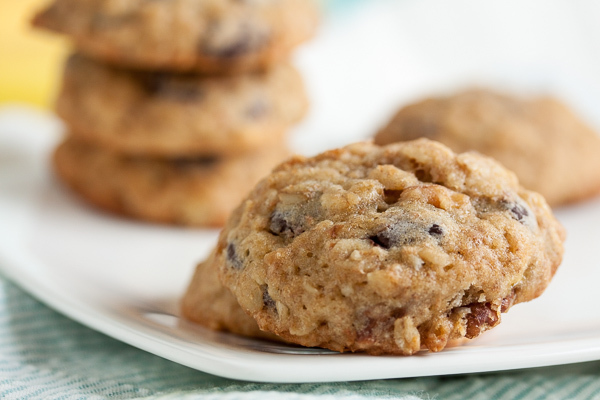 It starts off as a really good moist & chewy chocolate chip cookie. 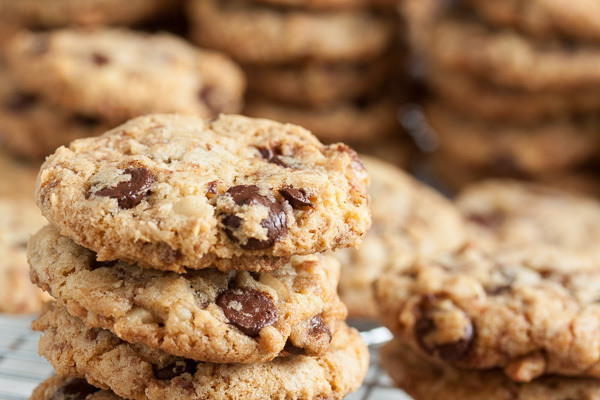 Adding butterscotch chips changes the flavour completely. Then we ramp up the flavour with a few drops of rum butter flavouring, and top it off with some crunchy toasted walnuts, and suddenly you’ve got a really spectacular cookie. 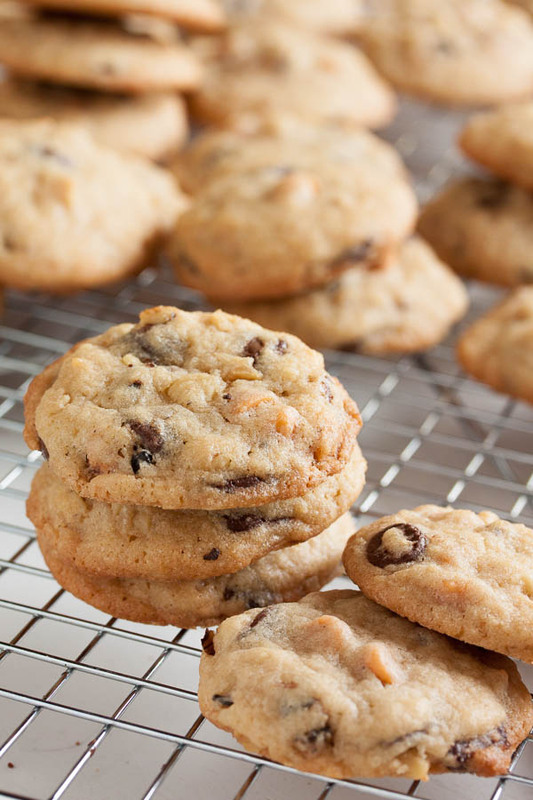 Adapted from "Butter-Nut Chocolate Chip Cookies" from The King Arthur Flour Cookie Companion. The original recipe says it will make about 48 cookies – I got pretty close to that with 58 cookies using my usual slightly larger than tablespoon-sized cookie scoop. To toast the nuts, spread them in a single layer on a baking sheet and toast them in the oven for approximately 10 minutes, turning them every few minutes or so to cook evenly. Trust your senses – they'll start to smell fragrant when they're ready. You can do this step and then set them aside to cool while you prepare the rest of the ingredients. Once cool, chop them coarsely, or break them up into pieces by hand. In a medium bowl, whisk together the flour, salt, baking powder, and baking soda. Set aside. In the bowl of a stand mixer fitted with the paddle attachment, beat the butter, sugars, corn syrup, and vinegar together on medium speed until light and fluffy, about 3 or 4 minutes. Scrape down the sides of the bowl and add the eggs, one at a time, beating well after each. Add the flavouring and beat again to incorporate. Turn the mixer down to low and add the dry ingredients, mixing until just barely combined. Remove from the mixer and add in the chocolate chips, butterscotch chips, and chopped nuts, either with a spatula or by hand. I prefer to knead inclusions in by hand to ensure they're distributed evenly. I just made these and they’re quite good but they’re “cakier” than your look in the photos. I think I’d like them a bit more if they were thinner and slightly crispier. I might try slightly more butter and melting it first next time. Ok, now that some time has gone by and they’re no longer warm just out of the oven, I like them even more and apparently, so does everyone else in my house because they are very nearly gone. 🙂 Thank you once again for the lovely recipes!